Hello, the app is really great. However, I have a problem. When I choose 2 different recipes in which the same ingredient is then we contain me the shopping list displays one ingredient. But there is no longer. What am I doing wrong. Hi Andre, thanks for contacting us. If I understand you correctly, you’d like to add the same ingredient from different recipes to your shopping list. To do this, just tap in the middle of an item (not the checkbox) and then choose “Add this item” or “Add selection”. Ingredient quantities will add up. Please let me know if you have any further questions. Hi Miguel, thanks for your question. Unfortunately no, Recipe or shopping list import from other apps is not available. However you can import product catalog under Menu –> Settings –> Pick list –> My picks –> Actions –> Import. Please see Configure Pick list User’s Guide for more details. Thanks for your feedback. 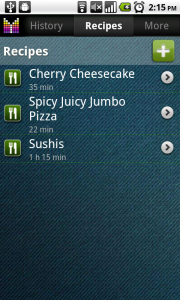 Excellent app for grocery shopping. Especally using recipes except typing on Droid is very slow. Is there a way to import/export recipes? So many to add but cannot on Droid. Bill, thanks for your feedback. Unfortunately, the only way to enter recipes now is using your phone. However, we plan to allow entering recipes online going forward. Please let me know if you have any further questions or comments. The question I have may relate to how I have customised aisles in my “groceries” list, instead of greating Master/Sub lists. What I’ve found though is that in my groceries list I have entered details (i.e. aisle, comments, etc.) for particular items as I’ve added them to my shopping list, but later on when I add these things as ingredients to recipes I don’t get that same information coming across. Would a Master/Sub list be a better setup for this to come across? 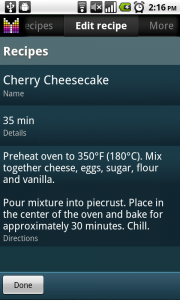 Is it also possible to add “cookbook”, “cook” and “page” information fields to the Recipes section? Currently I enter that under “Details”. Hi Bel, thanks for your questions. Regarding aisle configuration, it all depends on whether you have customized aisles for any of you lists or not. If you’d like to get a specific advice, I’d recommend creating a backup and contacting us with your account ID at hi@mightypocket.com. A few examples of items, their attributes and what exactly is going wrong would be helpful. As for new fields for recipes, it is unlikely that we are going to add them any time soon. Details field is designed to handle any additional information you might be interested in. Lisa, thanks for your feedback. Sorry for keeping you waiting for the new update. The plan for new update will be available soon. I want to have my ingredients listed in the order I put them in. Unfortunately it lists them the opposite way: last entered first on the list. Is there a way to change the default order so the first thing I enter is is always the top of the list? Perhaps under “Settings” a “sort-order” button? BTW after a rocky beginning I now have gotten the hang of your app and really like using it. I’ll love it when my wife gets a working cell phone & we can use it shopping separately in the same store! I just realized the default order: alphabetical. Now there should be 3 orders you can choose from: alphabetical, first-in top & first-in bottom. Ed, thanks for your comment. Unfortunately, alphabetical sort is the only option available in Mighty Grocery as of today. We may consider adding other options going forward. The reason it matters is you have to add the ingredients (bread made in a breadmaker) in a very specific order. Thanks for such a great program. I really miss my iPhone app for grocery shopping, but yours is filling the gap nicely. 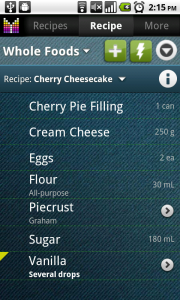 I to would like to be able to synch recipes and enter them on-line. My other question is… Where do items go that I enter when shopping? Say while shopping I add carrots to my shopping list. I enter all the item details, but when I make my next list I can’t see Carrots. What am I doing Wrong… Thanks. Kimberlee, thanks so much for your feedback. Kindly note that when you tap “Checkout” button in shopping list, all crossed-out items are saved in History with all details. The next time you add an item to a list, the app will use item details from History. Could you please let me know how you clean up your shopping list? Do you check out or just delete items? Thanks for supporting sync recipes feature too. 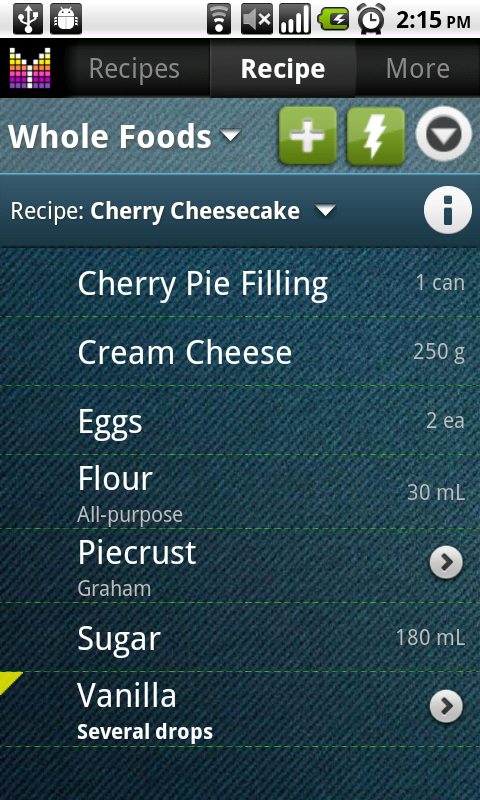 Great app – just one question: Is it possible to sync recipes with the cloud? I’d like to have access to my wife’s recipes without typing them in myself. Hi Chris, thanks so much for your feedback. Unfortunately, it is only possible to sync shopping lists at the moment. 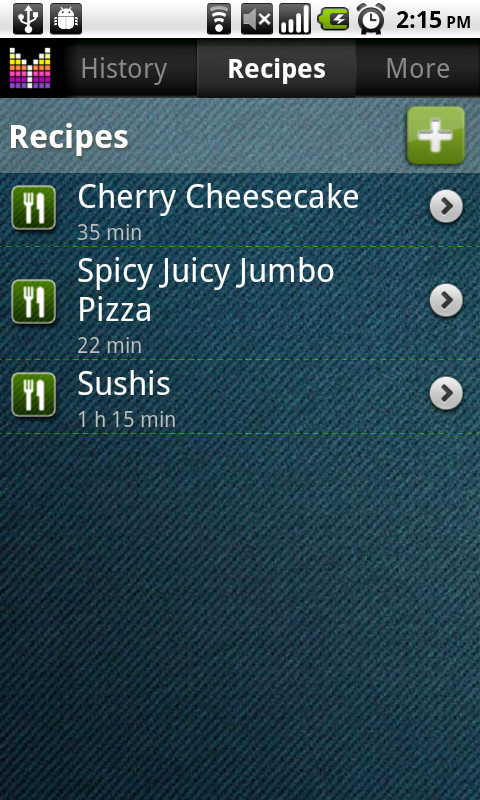 We plan adding recipe sync in the future. Thank you for your patience. Me again I add a lot of the same things to my list every week but the aisles in my store are completely different actually a bit strange if you want the truth for instance in 1 aisle on 1 side is frozen pizza and such on the other coffee and tea. What isle would I put the coffee in ? Lisa, kindly note that you can organize your aisles as you like using the Manage aisles feature. Also, you could customize aisles by store. I am not quite sure about coffee’s aisle. Perhaps you could create two records in the app for each side of the aisle? Hello I love your app. I use it everyday. The only thing I wish were different is the ability to search for recipes online. I noticed in some of the old comments, that other users would like the same however no update has been in place yet. Do you have a timeframe or suggestions for me? Lisa, thanks for your feedback. Indeed, online access to recipes is planned, but unfortunately, no timeframe for the update. Thank you for understanding.